I am not shy about how much I love sorbets. 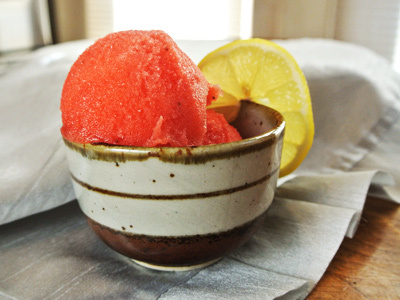 Sorbets are so refreshing and take little time out of your day to make. I’ve been a little obsessive lately trying different fruity combinations and this is definitely one of the best!! 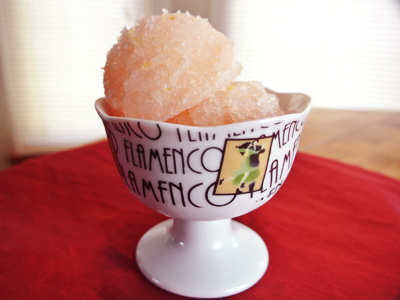 I am partial to citrus flavors and the fusion of grapefruit, lime and margarita is hard to beat. Joe and I kept stopping by the freezer for “just a taste” and it was gone in no time. So I made a smaller batch and poured into popsicle molds to see how they would freeze. It was like a frozen margarita on a stick, a fun adult treat that we will be enjoying a lot this summer! A few warm days is all I need to get in the mood for Springtime. Any day with sunshine and above 50 degrees is a day to be outdoors and watch the Robins that have just returned home. It’s a sure sign that Spring is just around the corner when the trees begin to bud and my outdoor herbs start to break through the ground. I think of lemons in Springtime with the colors of sunshine. Some fresh squeezed lemonade would be refreshing but what I really wanted was some sorbet. Along with a bag of lemons, I found some bright red strawberries to add to the mix for a Strawberry Lemonade Sorbet. A frozen treat that was not too tart and not too sweet. You would think it was tropical season from the ads that came out this week in our local grocery store. A sale on exotic fruit from Dragon Fruit to Rambutin, to Star Fruit to Mango and Papayas. I am not one to let a good sale go by so I picked up a little of everything. 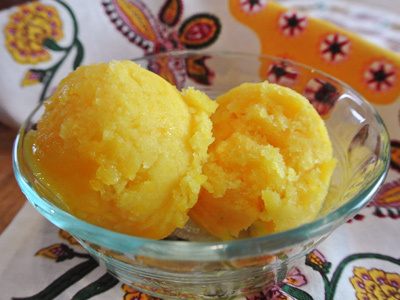 But what I had in mind was a Mango Sorbet that I’ve been dreaming about ever since I got my ice cream maker. It’s so handy and makes quick work especially with sorbets. It basically requires a simple syrup mix of water and sugar plus added fruit. How easy is that!